In what is being billed as a first-in-the-nation pilot program, students from lower-income and middle class families are being offered the chance to attend New York’s public colleges and universities for free. This weekend, lawmakers approved Governor Andrew Cuomo’s plan for the Excelsior Scholarship, a tuition-free plan paid for by taxpayers and possibly higher tuition fees for those not eligible for the free ride. Hillary Clinton made a surprise appearance yesterday alongside Cuomo as he signed the bill. She not only endorsed the bill, but said she hopes it’s a national model for other states to follow. Beginning this fall, students from families earning no more than $100,000 this year and up to $125,000 by 2019 can attend any state college or university for free. Tuition is currently $6,470 annually for four-year schools and $4,350 each year at community colleges. The program will not cover extra fees and room and board which add up quickly. At the State University of New York (SUNY), fees cost $1,500 annually then add another $12,590 for room and board for those living on campus. At the City University of New York (CUNY), fees are an average of $475, but add on another close to $12,000 if you’re not a commuter for housing and food. This program is expected to cost $163 million in its first year. It also includes $8 million to pay for resources such as e-books. Students must be enrolled in college full-time, maintain a healthy grade point average, and graduate on time. 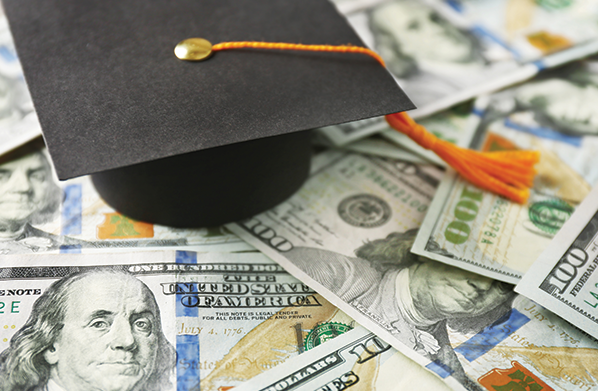 Unlike other proposals, after graduating participants must live and work in the state for the same number of years as they received the scholarship. The cost of college is rising for public and private institutions because of the availability of public funding. Schools have no incentive to control and drive down the costs of educating students knowing that funding is guaranteed. As a result, young people are graduating with down-payment-sized debt. Offering free tuition is not the panacea. It’s just another guarantee of public funding for schools to rely on. Is there an expectation for public schools to lower costs? Furthermore, what accountability is in place to ensure that students stay in the state once they graduate to avoid brain drain? Will New York hire administrative staff to keep tabs on students or depend on the honor system? Any serious enforcement will likely incur greater overhead costs. Interestingly, this harkens back to a free-market-friendly idea called income-sharing agreements that have been around for a while. Companies or nonprofits can invest in a student’s education in exchange for a share of their income in the future. It’s an idea that has merit, but New York’s plan is not quite that. The goal of the provision is to keep more college graduates in-state. The idea is that it’ll increase the return on taxpayer dollars being spent on the Excelsior Scholarship through increased tax revenues. Unfortunately, this is a solution in search of a problem. There’s no evidence that brain drain should be a big concern for New York State. Some have estimated that 80% of New York State college grads stay in state after graduation. That means that the state is going to be on the hook to build the costly administrative infrastructure to implement this policy, which has the potential for only a very small return. The state would be better off eliminating the provision and cutting their losses. The cost of college is a major problem because it straddles students with debt. Yet, the solution should not be to make tuition free which will only drive the costs of college higher and require taxpayers and students who don’t benefit from such plans to foot the bill.